Components: 18 dog cards, each with Poise, Agility, Wiggle and Speed. Any remaining dogs place in the Pound face up. The Pound is a row of dog cards off to the side. Begin Drafting. Or, for a quick start, play with the starting dog cards dealt. 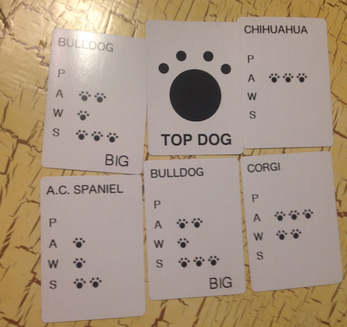 Each player selects 1 dog from their hand and puts face down in front of them, then passes the remaining dogs to the player on their left. When all players have drafted cards this way, players pick up the dogs they put face down. These dog cards become their hand for the game. 1. If P, A, W and S medals are all on their letters, move the medal back off each letter. All 4 medals are now available. 2. All players select a dog from their hand and place face down. They can play either face down in an empty space in front of them (a new dog), or add it face down on top of their previous contestant, if one exists. This is called breeding. 3. All players reveal their dogs. If they bred their new dog with their previous contestant, combine the stats of the two dogs for awarding medals. All contestants including any new contestant or previous contestant, are counted. If a tie is between a player's previous contestant and current contestant breed, their previous contestant wins. 4.1: Evaluate the medal assignment first, THEN do Phase 5. A winner can still tie with a later medal and prevent it from being won. For example: a Bulldog might win the A medal. An AC Spaniel also in play would not win the W medal because the Bulldog tied. If the AC Spaniel was a new contestant, then it will have the opportunity to win the A medal the next round. 5. A player with a winning dog places that dog face up to their side in their Champion section. The Champion section is a space close to that player away from other cards. This dog is worth 1 point. If the contestant was a breed, put all dogs bred atop of the winning dog into the Pound. 6. Move any previous contestants into the Pound. If a previous contestant breed is multiple dogs, seperate them and move them into the Pound. If a player added a new contestant that did not win a medal, it moves to previous contestant position. 7. If there are 4 or more dog cards in the pound, Rescue phase begins then Play resumes. 1. Starting with the player with the least points (if tied, the closest to the left of a player with the most points. If still tied, the player who last walked a dog), add 1 dog from the Pound to your hand. 2. Rotate left to the next player with the same number of points as you. If there are no other players with the same number of points, continue Rescue with the player who has the next lowest number of points until there are no more dogs to rescue. First player to get 3 Champion dogs wins! If more than 1 player an equal amount of Champions then continue playing until one player takes the lead.